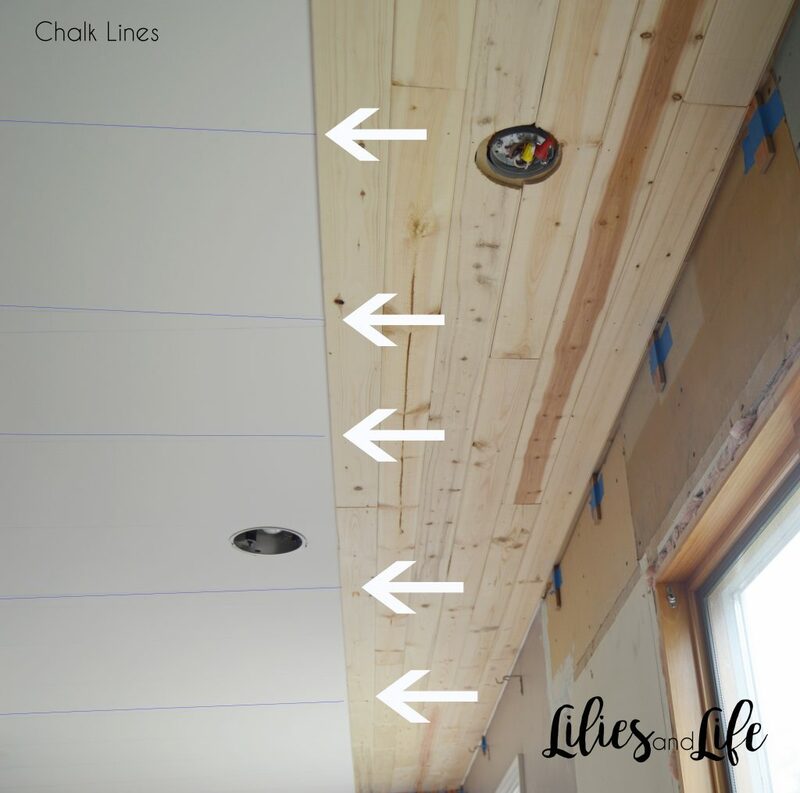 Before we started to plank our ceiling, we found all of the studs in the ceiling and made chalk lines along them across the entire ceiling. 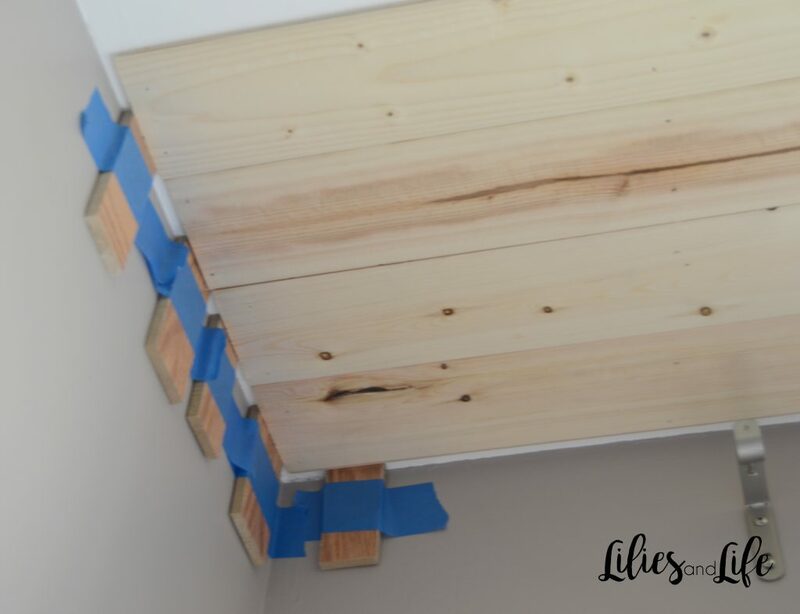 This will allow you to use those lines as guides to nail the planks into the ceiling studs. 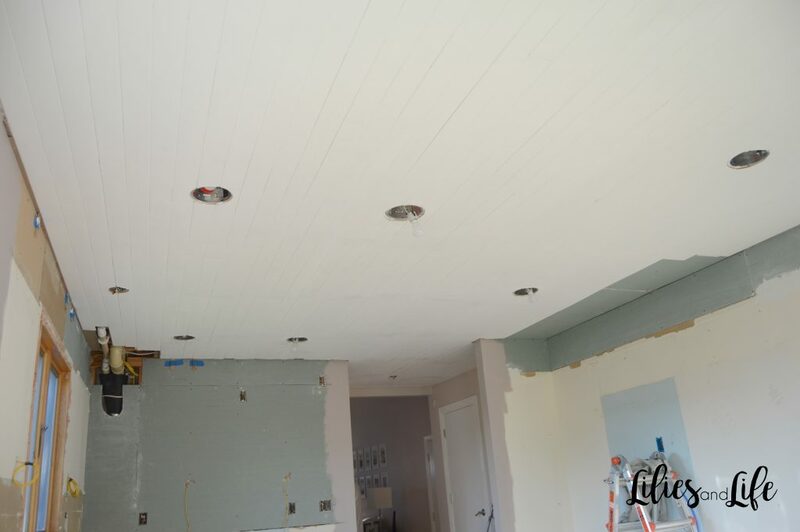 Next, we needed to prep the ceiling with spacers. Spacers are necessary because you do not want your planks touching the walls. 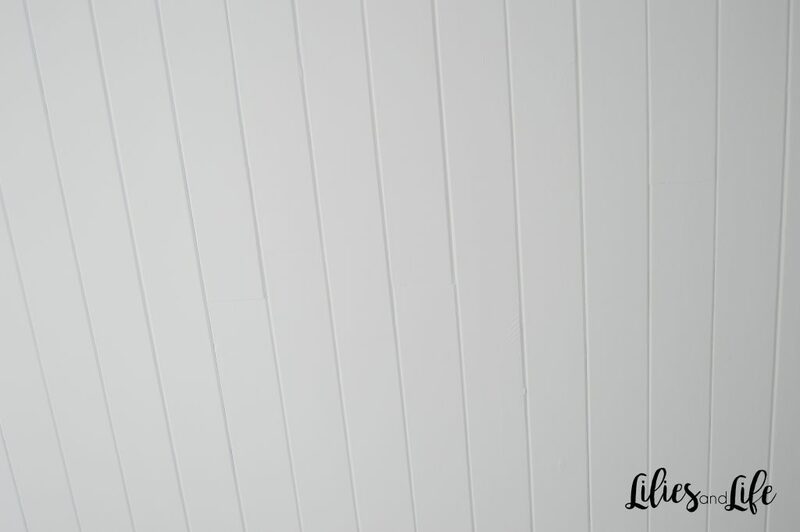 The humidity can make the planks shift throughout the year so the ¼ inch spacer allows for this shifting. We did not want to pay money for spacers so we were able to cut up our old laminate flooring into 4”x 2” x 1/4” pieces and use those as spacers. If you have anything laying around that is about ¼ inch thick that you can cut up, use that instead of buying spacers! Tape the spacers about three inches apart along the wall with painters tape. NOTE: This pattern would also work great for laying flooring! 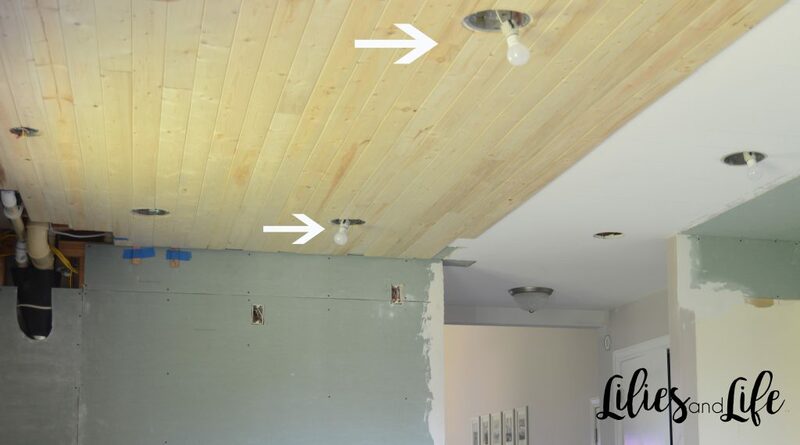 Once the entire plank was glued we nailed the plank to the ceiling with the nail gun at all of the chalk marks (studs). Make sure the groove part is facing out so that the tongue of the next plank can fit into that groove. 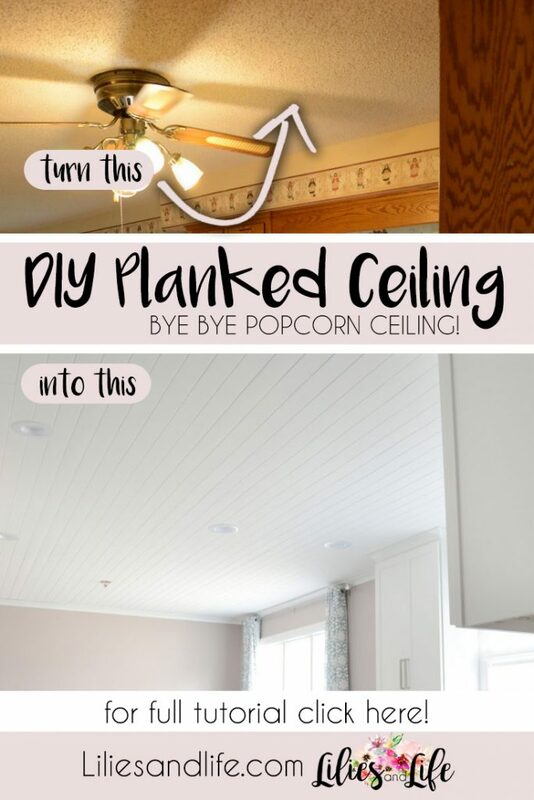 Continue the pattern and planking until you complete the entire ceiling. 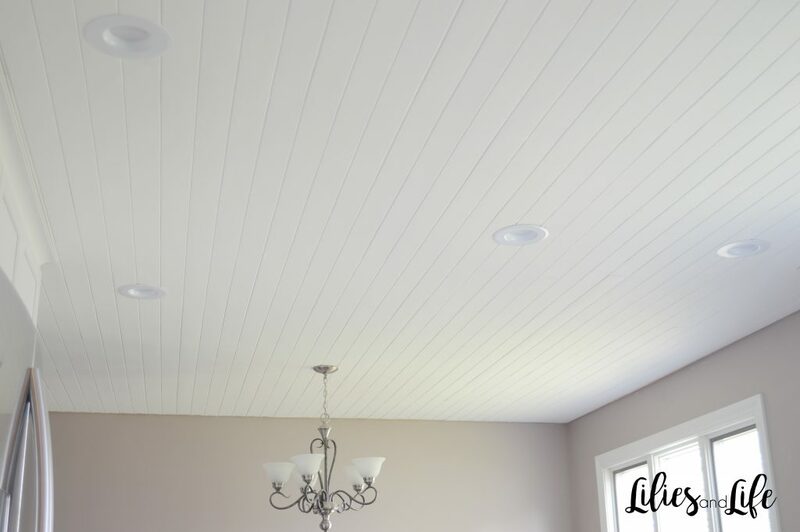 There will be light fixtures and corners you may have to cut around, so be careful to watch out for those and cut the planks using a jigsaw to fit around them. 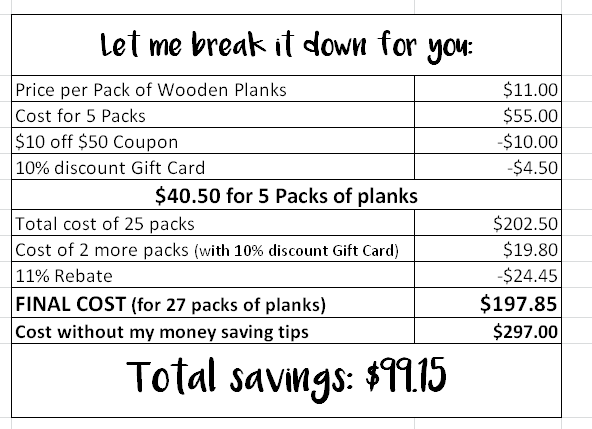 NOTE: These planks were on the cheaper end so there were a few that were broken, chipped or damaged. Make sure to buy a few extra bundles to account for this. 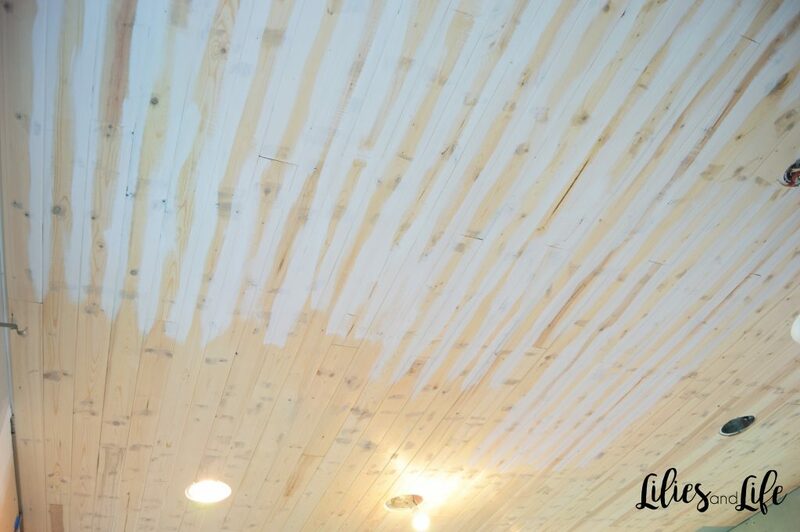 We wanted to paint the planks with white ceiling paint so we knew we had to fill in the holes and notches in the planks in order for the planks to appear smoother. This step was tedious but worth it! 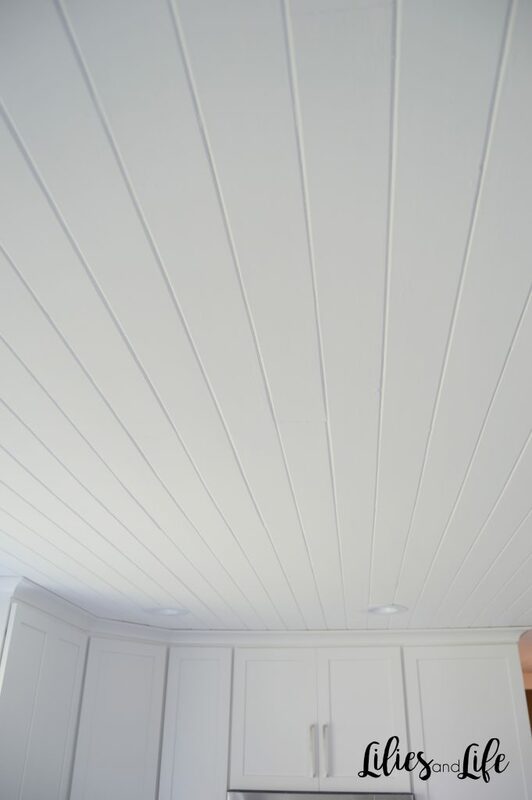 We used Minwax High-Performance Wood Filler. 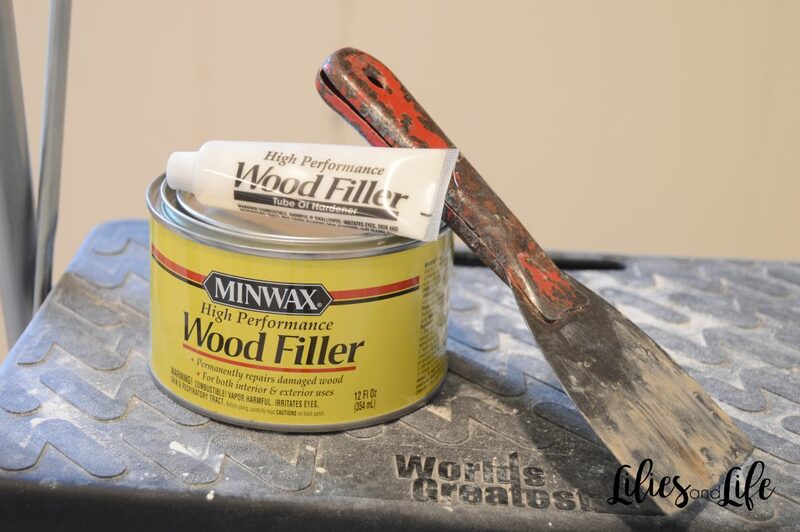 Be prepared; this wood filler is high quality, but kind of hard to work with. It dries quickly so only mix up about two tbsp worth of filler at a time. 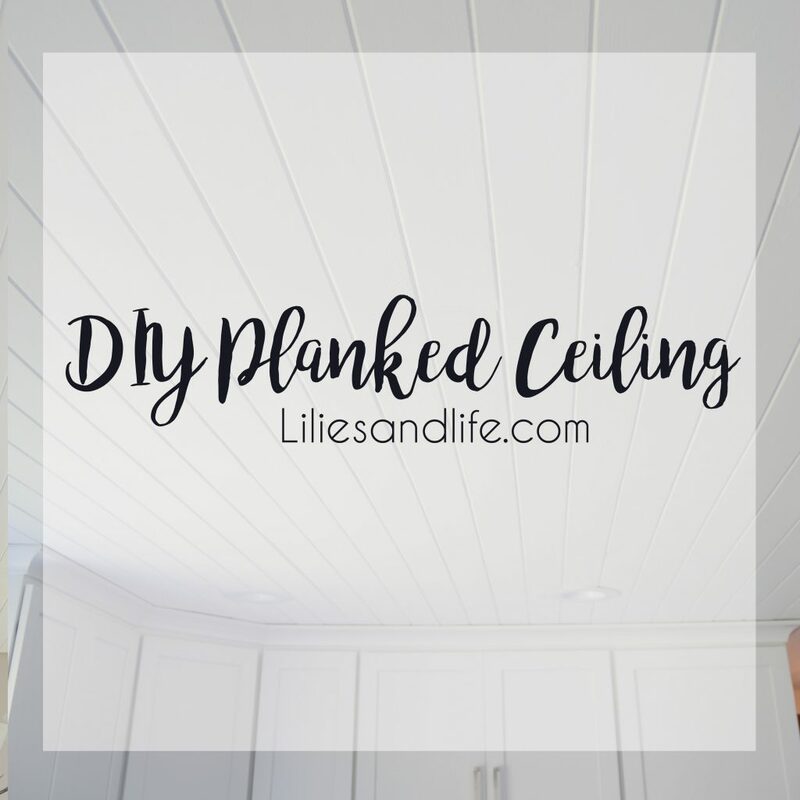 Use the putty knife and be sure to fill in any larger holes along with all the little nail holes you made when nailing the planks to the ceiling. 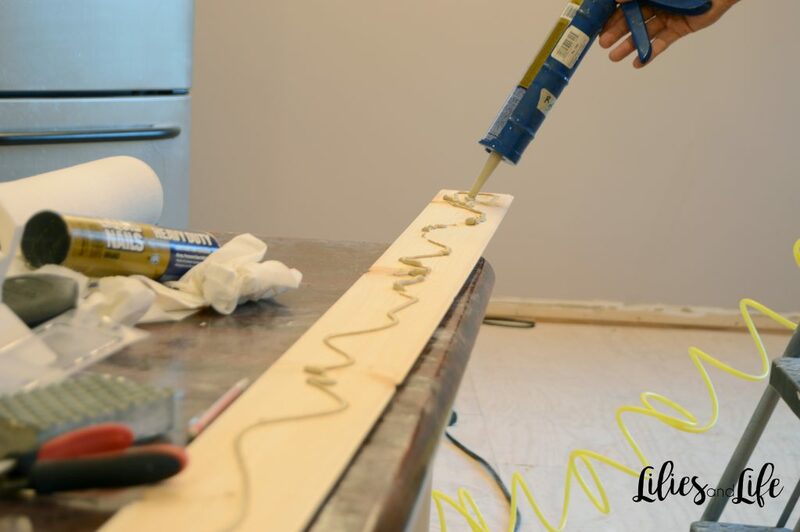 Once the wood filler dries, use the sanding Dust-Free Drywall Vacuum Sander without the vacuum hose. This type of sanding is not very dusty so you won’t need the hose attachment. 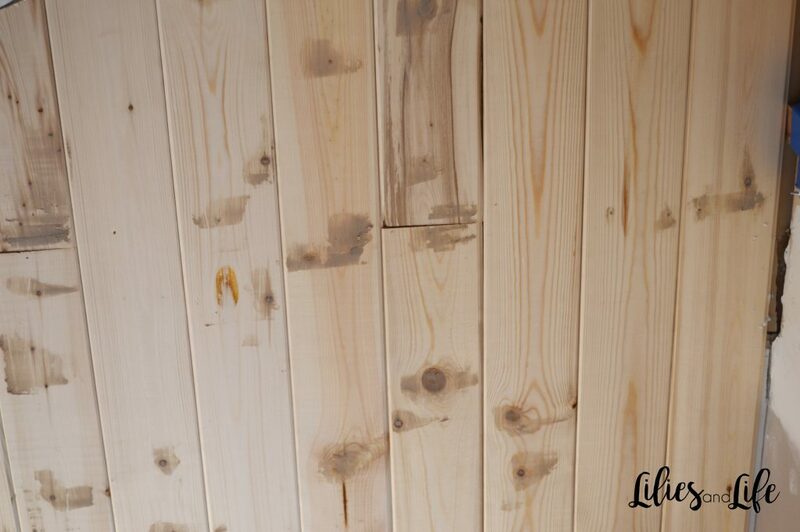 Use a fresh sanding screen and start sanding everywhere where you used the wood filler. Then David went through and rolled the entire ceiling. I only painted one thick coat on the inside of the cracks and then David painted two coats of paint with the roller. Once I finished spackling, I hand sanded quickly with a sanding sponge. The planks were then ready for the FINAL coat of paint! Planking the ceiling was VERY affordable, but it was a lot of work. We are so happy we did it and love how it turned out! 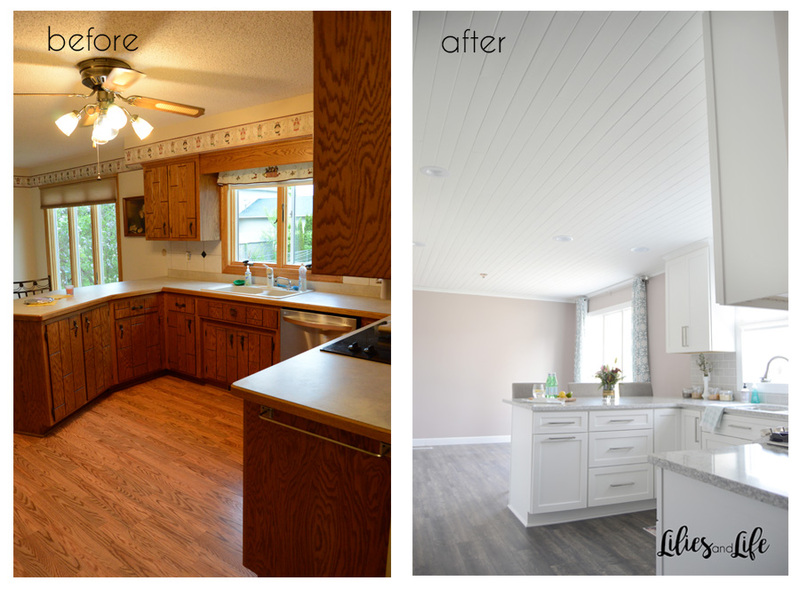 Check out our Kitchen Remodel for all the details on the complete remodel. 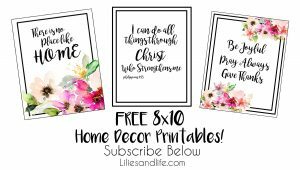 There is an alternative website to get free Lowes coupons (https://lowescoupon.net). 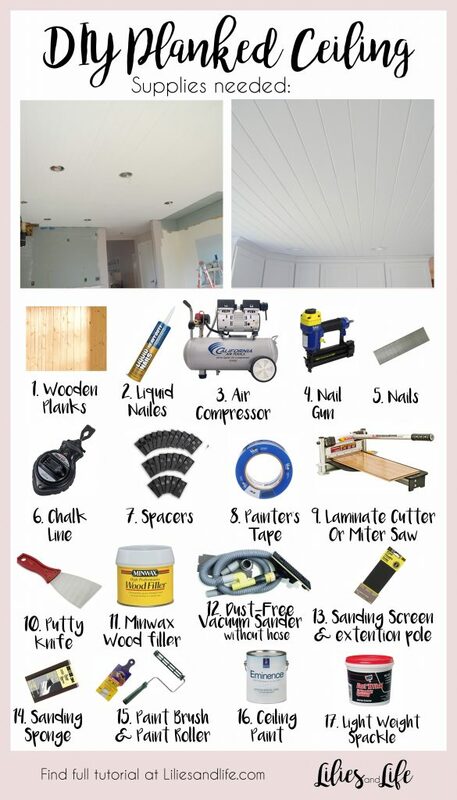 It is arguably better than http://renovopower.com/lowes.html because it doesn’t have all those super annoying ads and the codes are generated every 30 mins instead of hours. How long did it take you to do this? 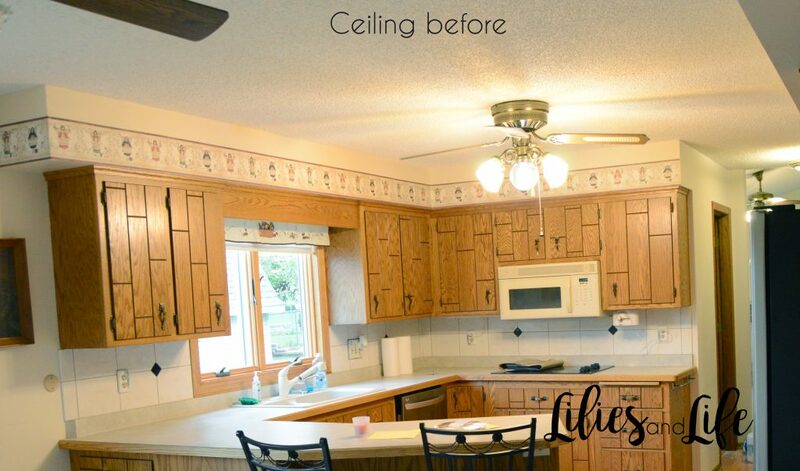 We have Popcorn ceiling all through our house but I’m just thinking about doing the living room, kitchen and dining room. Sandra, the kitchen ceiling took us about 4-5 hours of putting the planks up and then another 4-6 hours to fill the nail holes and paint (including drying time). It took a while and but we loved it in the end!